Egg-citing times ahead! Spend your Easter weekend with your loved ones by booking a table EGGS-ACTLY on Easter to enjoy these spegg-tacular deals in Bali! For first-time Chope reservations, score eggs-tra 300 Chope-Dollars when you book EGGS-ACTLY on Easter with the promo code EASTERSPECIALS. If you’re a returning Chope fan, this one’s for you. Get Rp 100,000 OFF your bill with a group of at least four diners using the code EGGSACTLY. Cheer and celebrate Easter Sunday with a brunch for the family! Priced at only Rp 399,000++/pax, free flow of soft drinks & juices. - Rp 200,000+/pax for free flow of Bintang Beer. Enjoy Rp 100,000 off for promotion above with code EGGSACTLY. What a better way to celebrate Easter Sunday than with a tantalizing brunch buffet with your loved ones. Enjoy the delicious dishes includes Seared Salmon with Tomato Chive Beurre Blanc, Roast Turkey with Maple Glaze, Pigeon Betutu and many more. Each dish is cooked in a way that best captures the genuine flavours of the authentic cuisine. Ensuring you enjoy a special day that’s deliciously indulgent. Price is at Rp 1,000,000++ for food only and Rp 1,400,000++ including free flow alcohol drink. 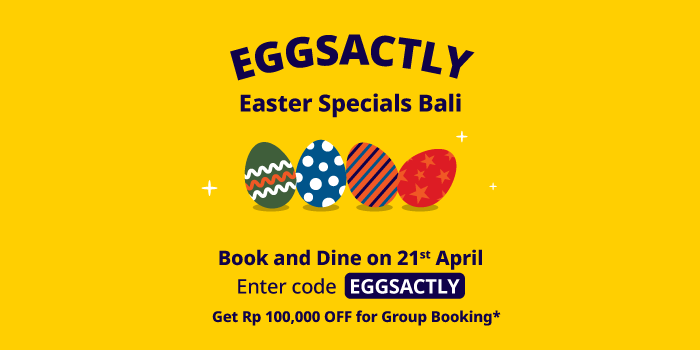 Enjoy Rp 100,000 off for Easter Specials Day with code EGGSACTLY. Celebrate Easter Sunday lunch at botanica and your kids can eat free! Sip and savor in W style, setting the scene on the most epic brunch spot on the island only at Rp 965,000/pax (food only). PILSNER PRICE DROP: Enjoy the dropping price of New Zealand Tuatara 5.0% Bohemian Pilsner 330ml pour for Rp 50,000. 2-FOR-1 OFFER: Double up on Oregon's Deschutes Mirror Pond Pale Ale with buy 1 get 2 Mirror Pond Pours between 4pm-7pm every day. Celebrate Easter holiday with your loved ones in a fun ambiance of our Sunday Brunch Adventura at Prego. Live Music | Lucky Draw with Bali Zoo Prizes and Afternoon Treats at Lobby Bar | Easter Egg Hunt | Egg Painting | Face Painting | Pinata | Easter Olympic Games. 20% off special for Marriott Bonvoy members. special performances by Romeos's Resident DJ and Live Band. And get our special B1G1 FREE promo for coldest beer, selected premium cocktails, and finest wine in the house. An endless buffet array of local and international favourites paired with free-flow of wine, beer and cocktails will complete your Sunday. Take in the easy grooves from our DJ and saxophonist while youngsters enjoy a dedicated children’s buffet, an Easter egg decorating class and a surprise visit from the Easter bunny and a magician. Celebrate the meaningful joy of Easter with your loved ones. Enjoy a sumptuous brunch indulgences at Boneka Restaurant, featuring the iconic lobster omelet, egg nouvelle, wagyu beef steak and eggs, as well as Avruga pearls and foie gras. Complimentary access to the Children’s Learning Center, bunny clown and egg painting activity shall delight our young connoisseurs. Children aged 3-12 years, receive 50% off. Celebrate Easter by eating well! Casa Luna provides a good variety of fruity bowls, such as Naga Bowl and Black Rice Power Bowl, a rich selection of egg dishes such as Luna's Brunch Antipasto and Mega Brekkie and super smoothies. Vegetarian and vegan options are available. 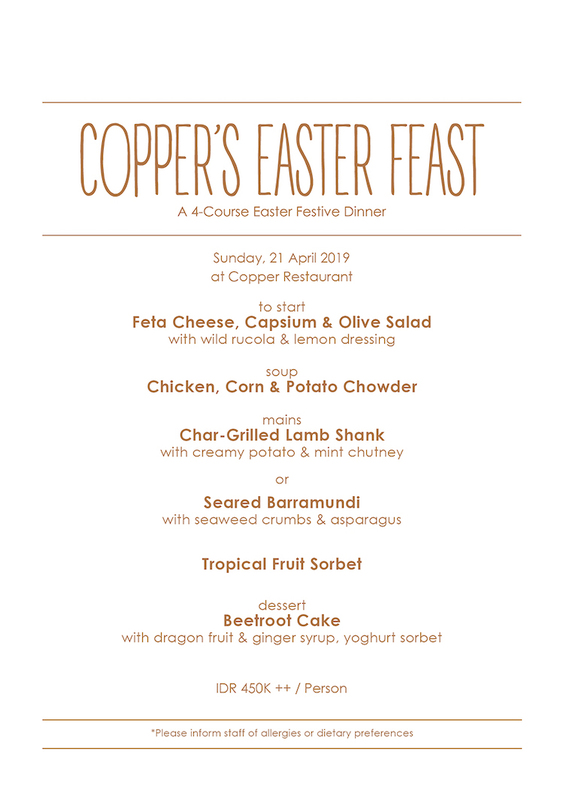 Come and celebrate this year's Easter at our rooftop and savor the Chef’s celebratory treat of flavory main dish options of a lamb shank with creamy potato and mint chutney or a seared barramundi with seaweed crumbs and asparagus heavenly served to your table. This must be one perfect Easter dinner you don’t want to miss. 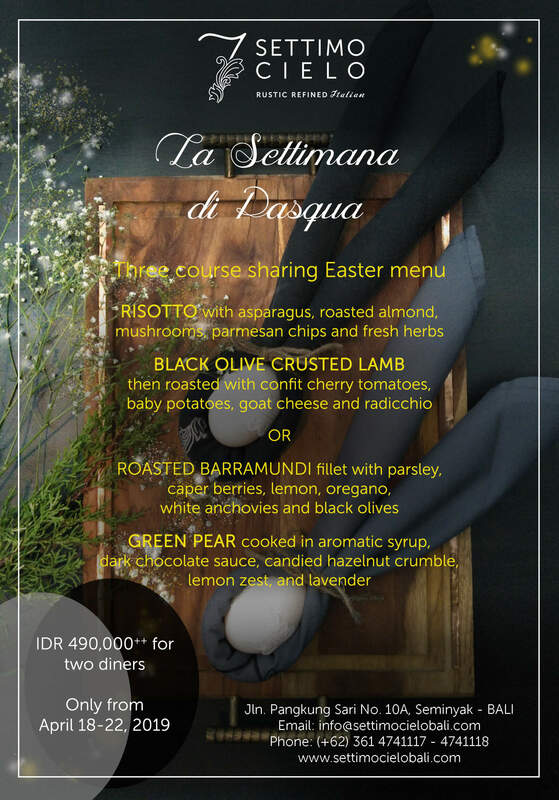 4-Course Easter Festive Dinner Menu only at Rp 450,000++/pax. Have fun with us while hunting for egg-citing gifts hidden in our Easter picnic and indulge in the unique flavours of Indonesia’s award-winning chocolate from Krakakoa. Adults activities: lamb carving, pastry creations, chocolate tasting and easter cocktails. Kids activities: bunny craft, decorate your easter basket, egg & face painting and egg hunting with easter bunny. 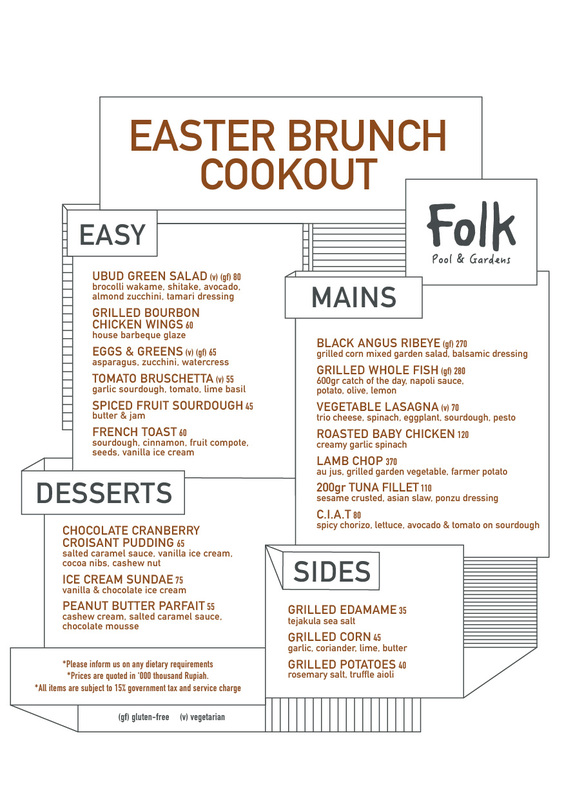 Folk’s Easter weekend celebration filled with scrumptious food, egg hunt and kids’ activities, fun prizes to be won! This Easter, the restaurant is offering a week of specials. Their special menu includes a Lamb Vignole and a Yellow Fin Tuna Steak, priced only at Rp 229,000++. Priced at Rp 1,888,000 net/pax including a glass of Nicolas Feuillate Champagne. Upgrade your experience for Rp 1,450,000 net/pax and enjoy an exquisite wine pairing, to accompany each course, from a selection of handpicked wines, by Chief Sommelier Jeroen Jochems. Celebrate Easter at Plataran Canggu this April, where idyllic gardens and traditional Indonesian architecture will play host to fun-filled holiday activities such as egg decorating and egg hunting, all framed by the idyllic beauty of leafy Canggu in Bali. Priced is at Rp 350,000++/pax, including 4-courses menu, free flow non-alcohol drinks, egg panting and egg hunting. The Easter Holiday is getting closer! Let’s have a fun day on Easter Sunday at Salazon Bali. Let your little one enjoy our Easter kids activities from egg hunting, Easter coloring, and Easter egg craft. 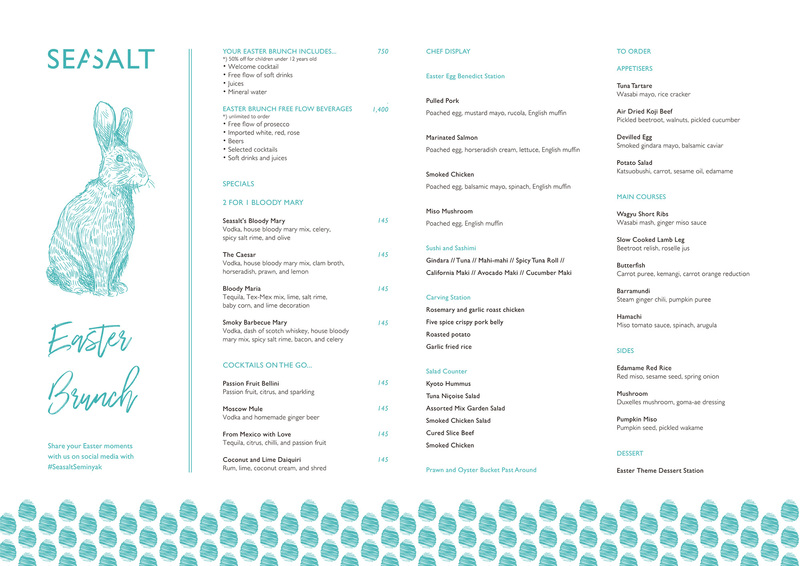 Celebrate Easter Day with your loved ones at Seasalt Seminyak and enjoy Special Easter Menu from us! Price starts from Rp 750,000++/pax and half price for children. Celebrate Easter with your beloved ones with Easter Brunch package only at Rp 965,000/pax (food only), Rp 1,615,000/pax (food and beverages) and Rp 2,365,000/pax (champagne package). For the whole Easter weekend, enjoy a very special Dine 4 Pay 2 promotion. As for the children, come on Easter Sunday and they’ll be entertained with various games and activities, with exclusive access to Splash Pool (terms & conditions apply). Celebrate Easter with custom-made cocktails from award-winning guest-mixologist Kiki Moka during sunset hours and delight in a stylish Easter Sunday lunch at The Restaurant with your loved ones. - Applicable only for bookings made on Chope app or web. - Valid only for minimum of 4 persons (or more) per reservation. - Restaurant will deduct Rp 100,000 from the bill. - Chope has the right to change the terms and conditions if needed. - The value of the voucher excludes tax and service.